Formed in 1968 as Sweetshop, Tucker and Connolly had previously played in a Harrow-based band called Wainwright Children, which did not make it onto vinyl. Frank Torpy left after their first 45 and his replacement Mick Stewart played on the next three before Andy Scott joined from Elastic Band, who cut two albums and a 45 for Decca. Steve Priest seems to have had no prior professional experience. Their first 45 on Fontana and three others on Parlophone were unremarkable and made little impression although they all (especially the Fontana one), change hands for considerable sums of money now. The band's big break came in late 1970 when they teamed up with songwriters Mike Chapman and Nicky Chinn. They got the group a deal with RCA and wrote their first hit, a bubblegum number, Funny Funny for them. Like most of what followed it was musically awful, but it proved popular with the potentially large teenybopper audience. Their first album appearance was on one side of a Music For Pleasure album, with The Pipkins and their sole hit, Gimme Dat Ding, which the album was named after, filling the other side. The Sweet's contribution consisted of their earlier recordings for Parlophone. Their next 45 release Co-Co climbed to No 2 and prompted Parlophone to reissue All You'll Ever Get From Me, which proceeded to stiff for a second time. Next The Sweet recorded a less banal song Alexander Graham Bell, about the inventor of the telephone. The fact it could only stumble to No 33 clearly led Chapman and Chinn to return to the earlier successful teenybopper formula of banal lyrics and very basic music with Poppa Joe, which became the first in a long series of hits. They became very closely associated with the 'glam rock' movement appearing on TV shows like 'Top Of The Pops' (their hits made them a very regular feature over the next few years) in flamboyant costumes, make-up and glitter. Certainly their stage act brought its problems - they were taken to court in Belgium over an allegedly pornographic film clip and banned from the Mecca dancehall circuit in the UK for what was considered to be an overtly sexual act around the time of their Little Willy single. To promote their Wig-Wam Bam 45, a song about love among the American Indians, they dressed in feathers and ponchos. Blockbuster coincidently used the same riff as David Bowie's Jean Genie but kept it off the No 1 position and was possibly one of the finest examples of the band's music. Indeed it topped the UK Charts for five weeks. Hell Raiser, Ballroom Blitz and Teenage Rampage, which all reached No 2, helped maintain the band's momentum and in May 1974 Sweet Fanny Adams became their only UK Chart Album in the seventies. In contrast to their 45s it was entirely self-penned and proved that they were not limited solely to the three-minute pop song. Over the next few years they tried to make the transition from a pop band to a serious hard rock band and The Six Teens certainly was a pretty decent hard rock single, but all this simply alienated the teenybopper audience which had been the key to their success. In December 1974 they split from Chapman and Chinn to write and produce their own material and initially their first self-penned 45, Fox On The Run, was a big success. There was an inevitability about their decline, although they made several further 45s and albums before splitting in 1982. 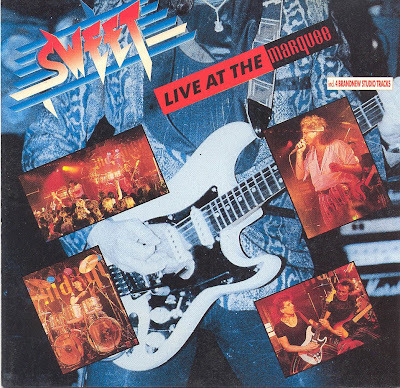 The Sweet are best remembered as 'glam-rock' superstars. Between 1971 and 1976 they enjoyed 15 consecutive hit singles so their commercial success is undisputable. Over the course of time, their music which was so maligned at the time has won a greater measure of acceptability among rock pundits.